Director – Eugene Lourie, Screenplay – Fred Frieberger & Lou Morheim, Based on the Short Story The Foghorn by Ray Bradbury, Producers – Jack Deitz & Hal E. Chester, Photography (b&w) – Jack Russell, Music – David Buttolph, Stop Motion Animation – Ray Harryhausen, Special Effects – Willis Cook, Makeup – Louis Phillips, Art Direction – Lourie & Hal Waller. Production Company – Warner Brothers. Atomic tests in the Arctic revive a prehistoric rhedosaurus that is buried in the ice. It then proceeds south towards its old hunting ground – where New York City now stands – destroying all in its path. The Beast from 20,000 Fathoms is the quintessential 1950s monster movie. 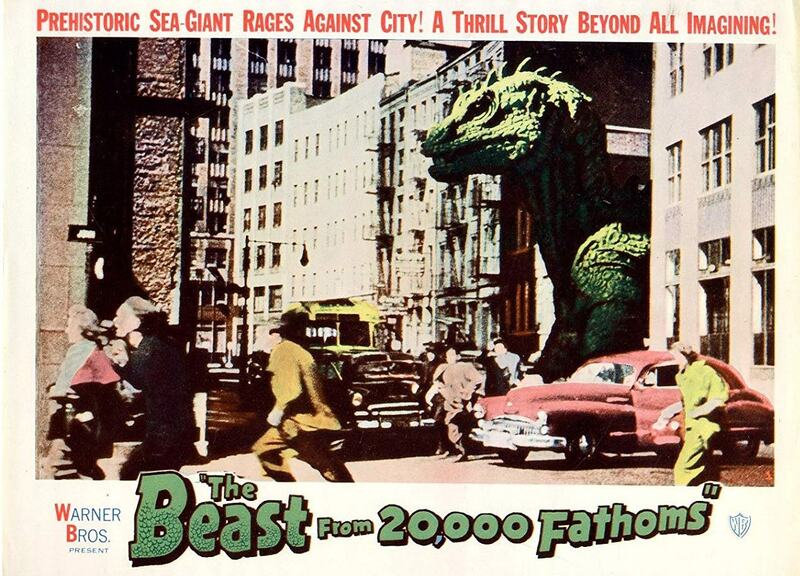 As it stands, The Beast from 20,000 Fathoms is not a particularly great film. However, sometimes in science-fiction and fantasy, the genre’s ability to carry social symbolism can have a potency and power that reaches out beyond the crude pulp confines it comes embedded in. This is certainly the case with The Beast from 20,000 Fathoms, which takes the formula of the monster loosed amok on civilization established by King Kong (1933). The Beast from 20,000 Fathoms never does anything particularly original with it – the rhedosaurus has none of the curiosity or sympathy that Kong evoked. Yet despite the relative crudity of the film, The Beast from 20,000 Fathoms carries a metaphor of breathtakingly concise imagery. The single thing that has been added over King Kong is the 1950s undertow of anxiety about the atomic bomb. The fear that the unleashing of the atomic bomb had created, the imminent sense of the world about to cave in, was so ominous and horrifying that it was never until On the Beach (1959) that filmmakers could come out and talk about it directly. Instead, most of 1950s science-fiction cinema couched the fears inside the images of monsters stirred up by the atomic bomb. The Beast from 20,000 Fathoms was the very first of these atomic monster movies – and the equations it makes are striking – monsters, it says, like A-Bombs are big, they both unerringly target in on large cities and mess around with people and property in a major way and, where The Bomb leaves radiation in its wake, the Beast leaves deadly germs. With its edgy Bomb symbolism, The Beast from 20,000 Fathoms seemed to touch a raw nerve in the public anxiety and soon The Bomb became the most readily available deux ex machina to hang a monster movie on and an entire new genre of monster movies was spawned. The film itself is slow moving and Eugene Lourie’s direction literal-minded. The film does pick up in the last quarter in the moody scenes with the military defending the city and the tense Coney Island climax. The film lays some claim to being based on a Ray Bradbury short story The Foghorn (1951), which was published in The Saturday Evening Post. The Foghorn is a brief story but contains a potent piece of imagery where a prehistoric monster mistakes the warning signal from a lighthouse for a mating call. Such a scene does appear in The Beast from 20,000 Fathoms but shorn of symbolic meaning and is the only connection between the short story and film. 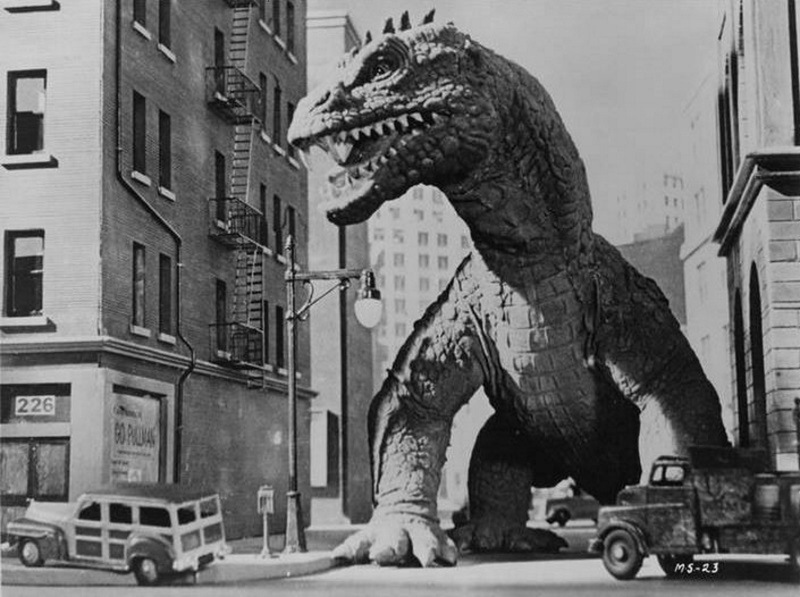 The Beast from 20,000 Fathoms was the first solo effects film made by Ray Harryhausen who later inspired a cult with his stop-motion animated special effects vehicles. This was clearly early days before Ray Harryhausen went onto polish his art in the likes of The 7th Voyage of Sinbad (1958), Jason and the Argonauts (1963) and The Golden Voyage of Sinbad (1973). Harryhausen’s rhedosaurus effects are so-so – the dinosaur is jerky and the opticals poorly matched. Plus its size has a habit of wildly varying – in one scene, it is as big as a lighthouse, in another its head is about the size of a car but then a policeman in its jaws can seem the size of a toothpick. Swiss-born Paul Christian (better known as Paul Hubschmid, under which name he had a successful career in German cinema and tv) is a poor choice as lead, playing through an appallingly thick accent. He is only exceeded in woodenness by his leading lady Paula Raymond. They are at least balanced by respectable performances from quintessential 50s military man Kenneth Tobey and a young Lee Van Cleef as a cocky sharpshooter. The show is fairly much stolen by an amusingly absent-minded, schoolboyish performance from Cecil Kellaway. Ray Harryhausen’s other films are:– the giant atomic octopus film It Came from Beneath the Sea (1955); the alien invader film Earth Vs. The Flying Saucers (1956); the alien monster film 20 Million Miles to Earth (1957); The 7th Voyage of Sinbad (1958); The 3 Worlds of Gulliver (1960); the Jules Verne adaptation Mysterious Island (1961); the Greek myth adventure Jason and the Argonauts (1963); the H.G. Wells adaptation The First Men in the Moon (1964); the caveman vs dinosaurs epic One Million Years B.C. (1966); the dinosaur film The Valley of Gwangi (1969); the two Sinbad sequels The Golden Voyage of Sinbad (1973) and Sinbad and the Eye of the Tiger (1977); and the Greek myth adventure Clash of the Titans (1981). Former art director Eugene Lourie went on to direct The Colossus of New York (1958) and two other modern day dinosaur films with The Giant Behemoth/Behemoth the Sea Monster (1958) and Gorgo (1961). Other genre films from Ray Bradbury’s genre works are:– the alien invader classic It Came from Outer Space (1953) from his original screenplay; Francois Truffaut’s Fahrenheit 415 (1966) from his dystopian novel; The Illustrated Man (1969) from his short story collection; the tv movie The Screaming Woman (1972) adapted from his story about a woman buried alive; the dreary tv mini-series The Martian Chronicles (1980) from his classic book; the tv movie The Electric Grandmother (1980); the screenplay for the fine Something Wicked This Way Comes (1983) from his own novel; the tv anthology series The Ray Bradbury Theater (1986-92) where he adapted his own stories and hosted the series; his screenplay for the animated adaptation of the classic comic-strip Little Nemo: Adventures in Slumberland (1989); the screenplay for the animated children’s film The Halloween Tree (1993); Stuart Gordon’s adaptation of The Wonderful Ice Cream Suit (1998) about a seemingly magical suit; A Sound of Thunder (2005) based on Bradbury’s classic time travel story; Chrysalis (2008); and the tv movie remake of Fahrenheit 451 (2018).